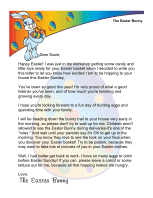 In this printable letter from the Easter Bunny to a little boy, the rabbit announces his intent to hop down the bunny trail with eggs and candy for the young man. Happy Easter! I'm getting my back feet all revved up and ready to hop down the bunny trail to your house. I'll try to move as quickly as I can, but you see, I have these heavy baskets! Do you think you'll find all the eggs this year? Don't be too sure! 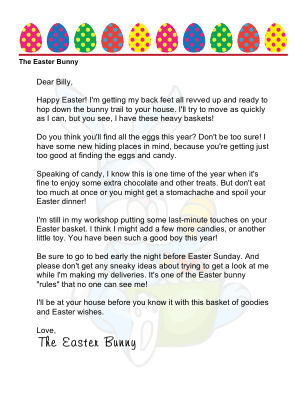 I have some new hiding places in mind, because you're getting just too good at finding the eggs and candy. Speaking of candy, I know this is one time of the year when it's fine to enjoy some extra chocolate and other treats. But don't eat too much at once or you might get a stomachache and spoil your Easter dinner! I'm still in my workshop putting some last-minute touches on your Easter basket. I think I might add a few more candies, or another little toy. You have been such a good boy this year! 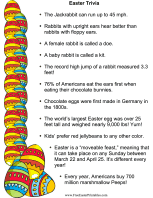 Be sure to go to bed early the night before Easter Sunday. And please don't get any sneaky ideas about trying to get a look at me while I'm making my deliveries. It's one of the Easter bunny "rules" that no one can see me! I'll be at your house before you know it with this basket of goodies and Easter wishes.